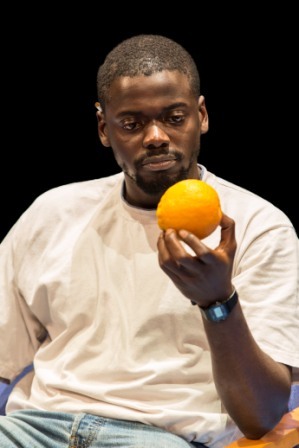 Blue / Orange: Young Vic Theatre. (seen at the afternoon performance on 4th June 2016). Another serious omission in my theatregoing history has now been corrected, as I’ve finally seen Joe Penhall’s acclaimed 2000 play – a mere 16 years late. Luckily, it’s in a sumptuously staged production. Linger on your way to the auditorium, it’ll pay dividends. The audience enters through Jeremy Herbert’s brilliantly designed hospital corridor and precisely detailed consulting room, laden with clues about the play to come. The auditorium itself has been constructed at first circle level, the theatre roof low to allow a focused, claustrophobic “in the round” atmosphere. The stage turns out to be the roof of the room you have entered via, and windows below it allow you to see into it. It is this element, more so than references to the “Millenium Dome” and “The Fuzz” (plus, doubly sad on the day it was announced, too, the greatest – Muhammad Ali) which turns what must have been in 2000 a socially biting critique into an invaluable historical artefact. What we now take for granted, fear and (for those of free-mind) regard as insidious invasion in our lives, was then in its ‘exponential growth’ stage. The clever but incompetent – as Robert here, is – found means to wield it as a weapon and career enhancing device, craftily at the expense of others under the guise of aiding them. Options for those unable to adapt, like patient Christopher, were ever-narrowing, and the world becoming a less forgiving and inclusive place – even as the adopted orthodoxy should have redressed the balance in his favour. Trapped in the middle, common sense entered its death throes as Bruce finds; the final resolution he chooses being pretty much inevitable. The master-stroke of this revival has to be the director’s choice of timing to stage this and spell it out clear for all to see – if they are able to remember a time before the play, or retain a single invaluable streak of individuality in their thought processes. That being a rare luxury, often dependent on how far your job requires you to make sure your “back is covered” at all times. Three gripping performances, prowling an intellectual wrestling ring and each gaining a hold, only for a twist to flip them into oblivion. The Orwellian metaphor of colour double-thinking, melded with race the intellectual leverage to do so. A prescient piece that time has come to show is actually an indictment and indeed warning of utmost importance. There were a few empty seats at the performance I saw. Make certain they are filled for the remainder of this not-to-be-missed revival. 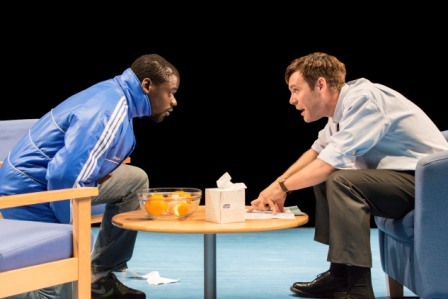 Photographs: Top: Christopher (Daniel Kaluuya) and Bruce (Luke Norris). Centre: Christopher (Daniel Kaluuya). 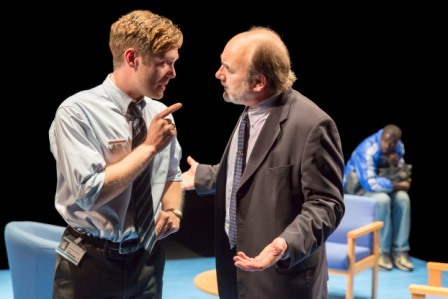 Bottom: Robert (David Haig) and Bruce (Luke Norris). By Johan Persson. Provided courtesy of the Young Vic Theatre, used by kind permission.